The essential oils have started to be recognized for their potential antimicrobial role only in recent years. Clinical experience showed that the efficacy of antimicrobial agents depends not only on their direct effect on a given microorganism but also on the functional activity of the host immune system. Since data on the effects of essential oils on the innate immune system are scanty and fragmentary, the aim of this study was to evaluate the influence of thyme (red) essential oil (EO), at subinhibitory/inhibitory concentrations, on intracellular killing activity by human polymorphonuclear granulocytes (PMNs) against Candida albicans. In order to provide a frame of reference for the activity of this EO, its in vitro killing activity in the absence of PMNs was also evaluated. 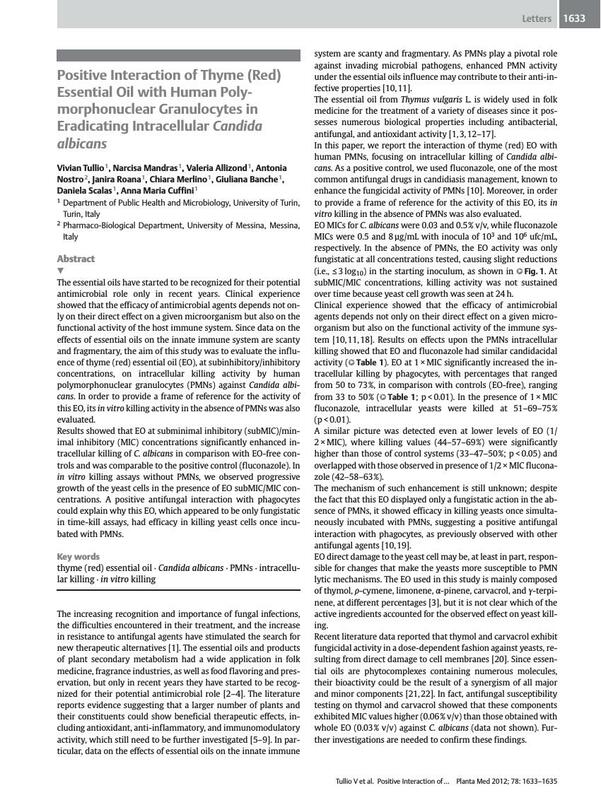 Results showed that EO at subminimal inhibitory (subMIC)/minimal inhibitory (MIC) concentrations significantly enhanced intracellular killing of C. albicans in comparison with EO-free controls and was comparable to the positive control (fluconazole). In in vitro killing assays without PMNs, we observed progressive growth of the yeast cells in the presence of EO subMIC/MIC concentrations. A positive antifungal interaction with phagocytes could explain why this EO, which appeared to be only fungistatic in time-kill assays, had efficacy in killing yeast cells once incubated with PMNs.